On March 23, 2018, the US media published an interview with the newly-appointed National Security Advisor John R. Bolton, where he stated that the only solution for North Korea is complete disarmament – following the example of Libya under Muammar Gaddafi. This scenario is exactly what Donald Trump and Kim Jong-un need to discuss during their negotiations. John R. Bolton is well-known as a hardliner regarding Pyongyang. During his work for the Department of State in the 2000s, he was one of the most furious opponents of any dialogue with North Korea, and more recently he advocated a preventive strike against it. According to him, North Korea and its nuclear program are a direct threat to the US and “given the incomplete US intelligence data on North Korea we should not wait until it’s too late.” On the contrary, “it seems justified that the US should respond to the North Korean nuclear weapon threat with a pre-emptive strike.” Apart from that, Bolton does NOT consider the Iraq War a mistake, he is a proponent of reforming the UN, taking the hard line with Russia and increasing aggression towards Iran. The author of this article believes that such initiatives prove that either John R. Bolton spent some time in some kind of a space-time loop and has no idea of what happened afterwards, or he is just an extremely cynical old-school hawk. Nevertheless, in exchange for giving up the nuclear program (which was at a much earlier stage than the North Korean one), Gaddafi got way more than Kim Jong-un was ever promised. It included total absolution – even the Lockerbie jet bombing was “ascribed to Iran”. Then the “Arab Spring” came and the fate of Gaddafi was very sad, after which many wondered what kind of fate he would have had, had he not given up the bomb eight years ago. No, it is, of course, highly probable that the “Green Book” author could have “earned” the Iraq scenario with the official US military invasion to fight the evil regime. But history has no “subjunctive mood”, and since then the Libyan scenario that used to be considered an example of a successful nuclear deal has not been mentioned without the ironic quotation marks. First, this is about taking irreversible actions in exchange for reversible ones. A disassembled nuclear reactor and blown-up missiles cannot be assembled back as they were. Meanwhile, any diplomatic relations can be broken, any shipments can be discontinued and, as experience shows, the pretext for that can be not even the change in the outcast country’s policy, but the change in the leadership of its counterpart: our ex-president could have signed anything, now our policy line is different. And North Korea relies heavily on its nuclear missile program as an efficient tool not only in maintaining its sovereignty, but also in raising the quality of life of the people. Today, some people fail to realize that the nuclear missile block is not the most precious and valuable thing. Conventional weapons equipped with expensive cutting-edge technologies cost more, but people are used to believing the following understandable idea: “the people are hungry and the government spends all the money on nuclear weapons.” Meanwhile, should North Korea search for a proportionate response, it would not end well for it. 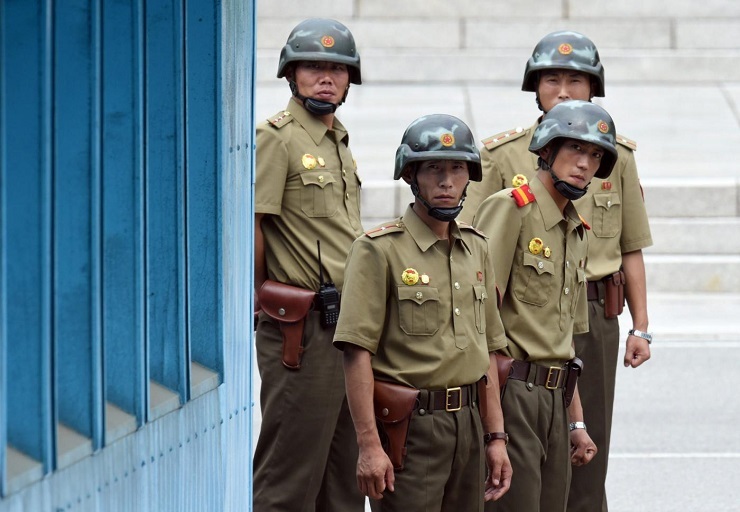 The South Korean military budget is 23-25 times as big as that of North Korea. And it has not only to do with the high salaries of the military personnel and equipping them with hand cream. Second, any nuclear deal of the kind is the question of guarantees. The existing world order has a distinct characteristic of the degradation of the existing norms. Relatively speaking, if one can still try making North Korea comply with its obligations by imposing international sanctions on it, then an attempt to call Washington, DC to order is, let us face it, much more problematic. That is why it seems that, speaking of the Libyan scenario, John R. Bolton means not only the events of 2003, but also those of 2011. According to old-school hawks, it is quite logical to disarm the enemy and then finish him off based on “the newly-found evidence”. The author would also like to draw the reader’s attention to why people like Bolton are in principle worse than the hawks like McMaster, Mattis or Pompeo, whose outlook is little defined by the military past. The thing is that, despite the stereotype about the military, in crisis situations that have to deal with the question “to strike” or “not to strike”, they usually choose the second option, as they start calculating possible casualties rather than possible political advantages. The first option is most often backed by the “pure” politicians who have no military or administrative experience and who are used to imagining war as some kind of a TV broadcast. If we consider John R. Bolton’s work record, he fits this category perfectly. In this context, we shall note the widespread opinion among the US conspirologists that the US is going to start a war on the Korean peninsula, but unlike the situation that took place 15 year ago, this time it is going to take a more competent approach. Unsubstantiated accusations may not do the trick this time. That is why the strategy has to be more subtle and include 2 elements. The first one is to provoke an inadequate action which could be regarded as a casus belli. In this case, the US acts not as an aggressor, but as a defender at the same time lowering the probability that Pyongyang should receive any help. Thus, it is well known that Beijing corridors of power many times heard the message that the 1961 treaty military assistance article will only be in effect if North Korea suffers an unprovoked attack. Then many things may be expected. And if the North is the first to attack the South, then China will surely call for a peaceful resolution of the problem and will express its great concern, but nothing more. The second element of the strategy is that the decision to start a war is made at the last minute and due to the circumstances. And until that moment, we keep talking a blue streak about the dialogue and peace actually only to throw our hands up in despair at the eleventh hour and say in front of the camera: “We honestly did our best. We were even ready to make concessions, but these scoundrels were so bad that we just have no other choice than to launch an air strike.” Even more so, as the Skripal poisoning case shows, to put a label justifying international sanctions “well-founded suspicions” are enough. Everyone knows that the terrible Putin has special invisible ninja agents, who leave no trace and evidence behind, and that is why the absence of traces and evidence is the main proof incriminating Putin. Naturally, he is the only one who has invisible ninjas. Yes, another anti-American conspirologist branch thinks that the illustrative flagellation, called to remind the world that the US remains the world hegemon and can trample anyone else, may be in fact aimed at Iran, not North Korea. And, getting ready to start a war in a new area, one has to take precautions with the old one, to avoid getting in two conflicts at the same time. Yes, despite its higher population and better-developed industry potential, in terms of cynical policy, Iran is a more acceptable target. First, it has a nuclear program, but no nuclear bomb. Second, there is no Seoul analogue that would ensure that the outcast country deals unacceptable damage to a strategic ally in case of a “pre-emptive strike”. Third, despite the fact that Russia and Iran share no border, it would harm the Russian interests no less than an attack in the North. Fourth, given the Iranian society structure and occasional mass protests, unlike North Korea, the US has more reason to rely on the success of its propaganda machine in terms of possible sabotage or treason. In this context, we cannot exclude that at the end of spring – in early summer the US will terminate the “nuclear deal” with Iran and then search for a casus belli after finding the Iranian trace in some outrageous act of terrorism.